We had a blast this week seeing all of the fantastic cards & very creative additional items you made that were inspired by the cards. A big jingle belles thanks to the fine folks from The Order of the Opus Glueii who tagged along with us ... we had such a great time creating with you this week. Remember, the Challenge at Opus Glueii runs three more days, so if you haven't linked-up your projects with them, you still have time. 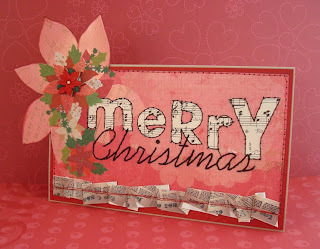 We loved Amy's adorable little recycled Altoid Tin, which contains fun little copic-colored elements so you can make more adorable holiday cards (more photos on her blog). 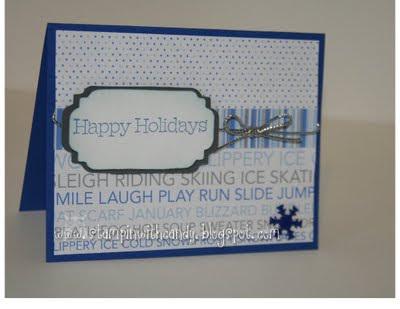 We loved how she made lots of fun little tags by using the same layout and swapping out lots of fun little holiday images ... so easy to mass produce (more photos on her blog too). You know we loved how she rocked pink for holiday card designs ... but we also adored how she decorated all of those sweet little holiday trees. And our Random Number Generator chose #8 as the prize winner this week ... Debbie of Debbie's Dash of This and That. Debbie - e-mail us your address & we'll get your fun holiday goodies in the mail. If you haven't already, make sure you skip through the links this week and check out all of the fabulous inspiration ... nobody's lonely this week. And come back and join us on Friday for another fun holiday prompt ... see you then. This week's theme is Lonely This Christmas (aka Tagging Along). We've teamed up with Rosemary and Jana and the rest of the talented team at The Order of the Opus Gluei for a special "crossover event"! This week's prompt is to make any kind of holiday card for Jingle Belles (yes, we're letting you off easy this week) ... and then so you're card won't be Lonely This Christmas ... make a second project inspired by your card that you will to link-up at The Order of the Opus Gluei. 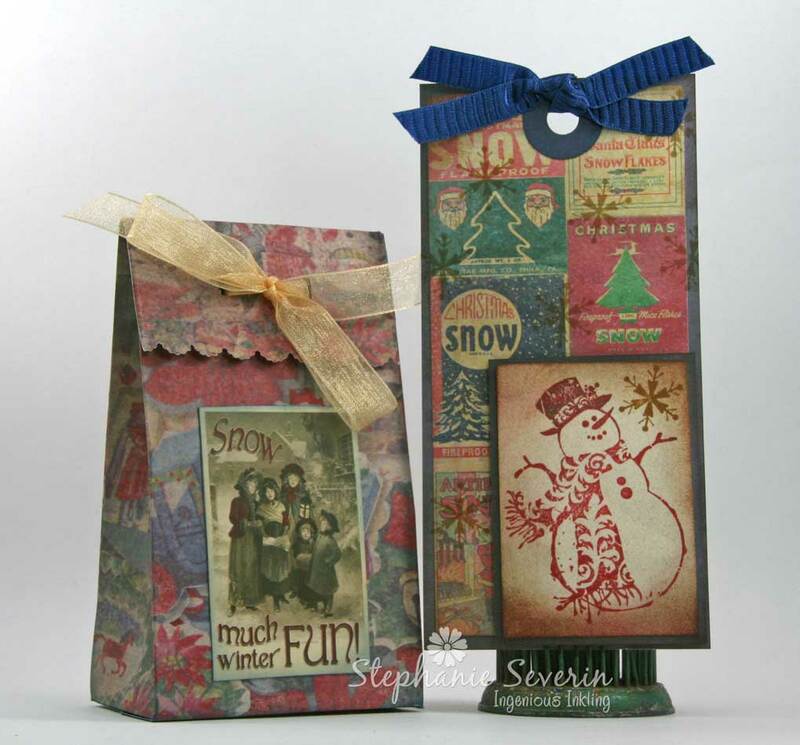 You second project can be a tag (get it ... tagging along), a gift box, a gift card holder, a gift bag ... you name it ... some inspired project you'll be so very glad you already have completed when the holidays roll around. of jewelry or other small gift. 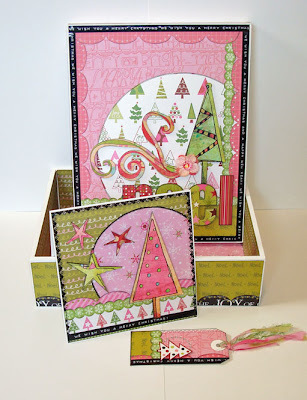 Lauren says, "my favorite holiday color combination is green and pink, and imo the best collection ever to use those colors was the (alas, short-lived) "noel" collection that elise flannigan designed for ki memories, which i admit to having seriously hoarded. 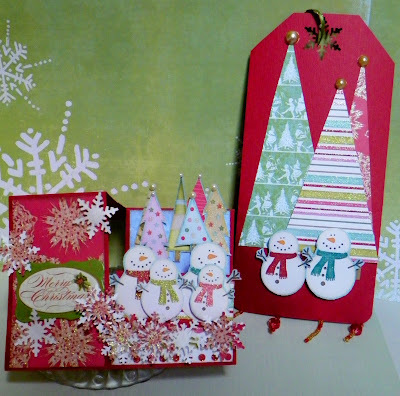 i was so inspired by these beloved products, that in addition to my tag and card, i used last week's sketchy thursdays sketch to customize a plain wooden document box from michael's to serve as storage for my increasingly large and beloved stash of JINGLE BELLES cards! this replaces my previous card storage solution... a big (but not very festive) tupperware container!!! :)"
Link up your tag and card here and at Opus Gluei by 6pm (EST) next Wednesday, June 29th for a shot at *both* randomly-awarded prizes!!! Keyword for galleries and flickr is JB26. 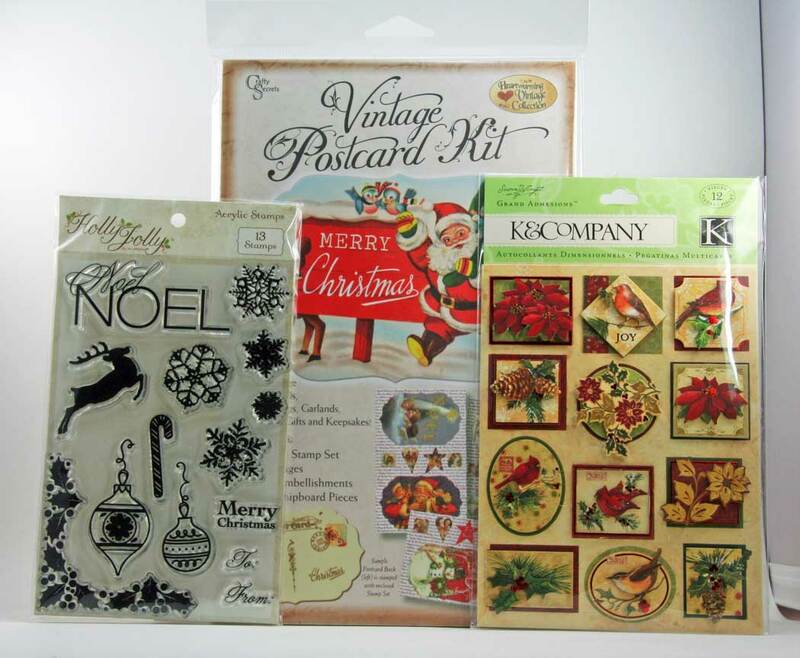 Our prize package for one lucky participant includes a set of Holly Jolly Acrylic Stamps by My Mind's Eye; a Vintage Postcard Kit from Crafty Secrets; and Susan Winget Grand Adhesions Dimensional Stickers by K&Company. A big woot woot to all of our Bundled-Up participants this week. 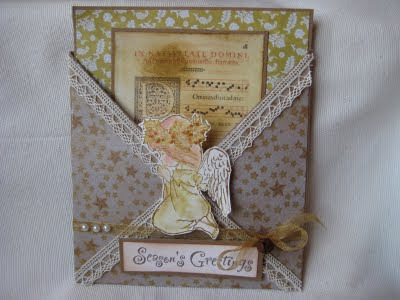 We had lots of wonderful layered-up cards to enjoy. Also, a big thanks to our Lovely Guest Star ♥Candy Blake♥ for joining us this week with her fabulous prompt idea. 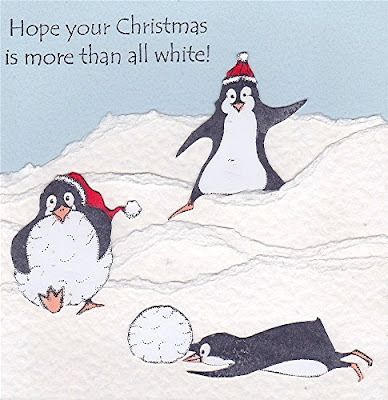 and how can you not smile at those fun penguins?? 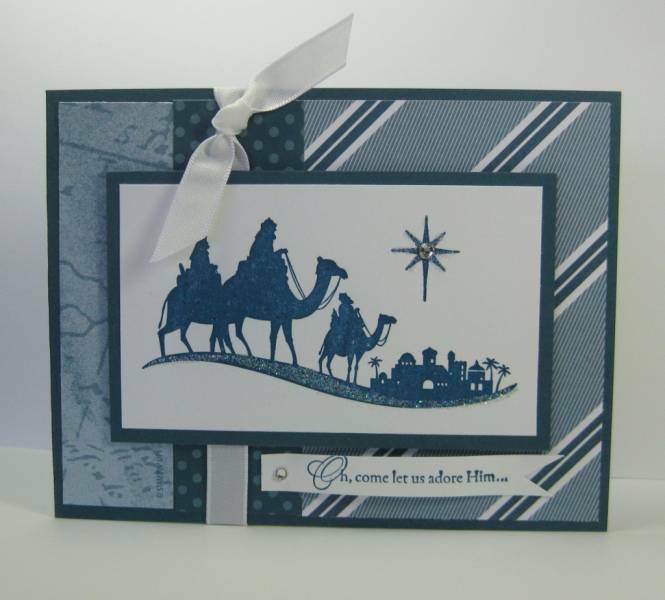 and the wonderful details in her elegant holiday design. love the elegant pearls and lace. If you haven't already, make sure you take a walk through the fabulous gallery of Bundled-Up Designs below ... you will find so much to inspire you. We've got something extra-special planned for tomorrow's prompt. There will be several lovely guest stars and some prizes you won't want to miss ... see you then. This week our Lovely Guest Star ♥Candy Blake♥ is asking us to celebrate the holidays by bundling up ... so we're asking you to add lots of layers (three or more!) to create your cards this week. Candy says, "All Bundled Up" came to me while I was thinking about the warm and cozy feeling of being bundled up (inside, of course!!!) against the cold. 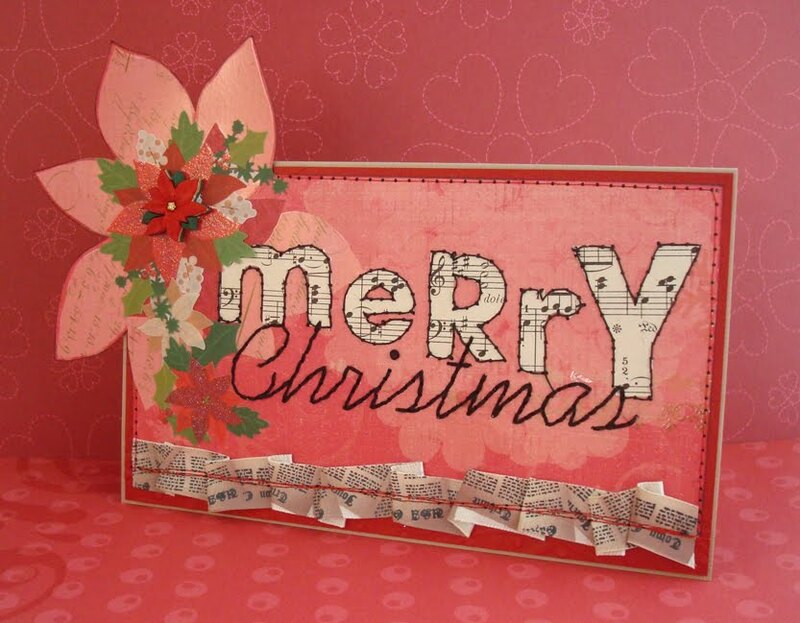 When I'm paper crafting, I really love the challenge of seeing how I can play around with different elements, like tags, patterned papers ,etc, to create something unique and fun! 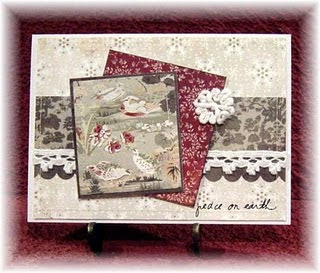 This card reflects my love of layers.... lots of 'em!!!!" 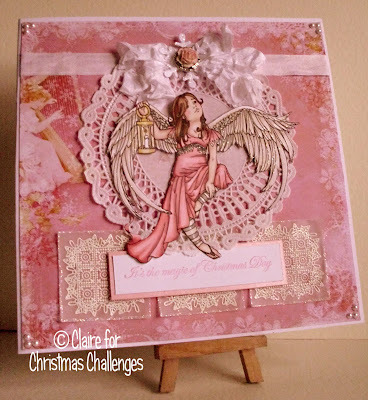 Stef says, "This week's CPS Sketch is perfect for lots of layering. 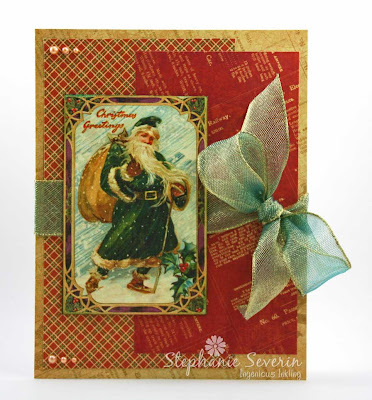 I used Graphic45's Christmas Past Collection for my entire card. 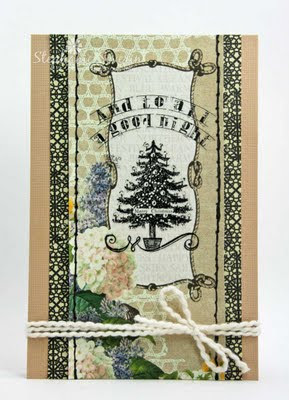 Lauren says, "i also used a sketch, from a fabulously named blog that's new to me, "try stampin' on tuesday! "; i love that it already had LOADS of stacked panels just waiting for me to fill 'em in with scraps of patterned paper old and new--each one matted to "up the layer count" lol!-- a vintage poem from ideals magazine and an image cut from an old greeting card, etc. i also added layers of inking, machine-stitching and epoxy stickers for even more dimension, and finished off with some pre-layered chipboard letters as my sentiment!" And now it's time to see how you'll be inspired by "ALL BUNDLED UP"! Will your layers be patterned paper, cardstock, chipboard, fabric, paint, stamped images... or all of the above? Just make sure to include *three* layers (or more!) and link up here before 6pm (EST) next Wednesday, June 22nd. The keyword for galleries or flickr is JB25. 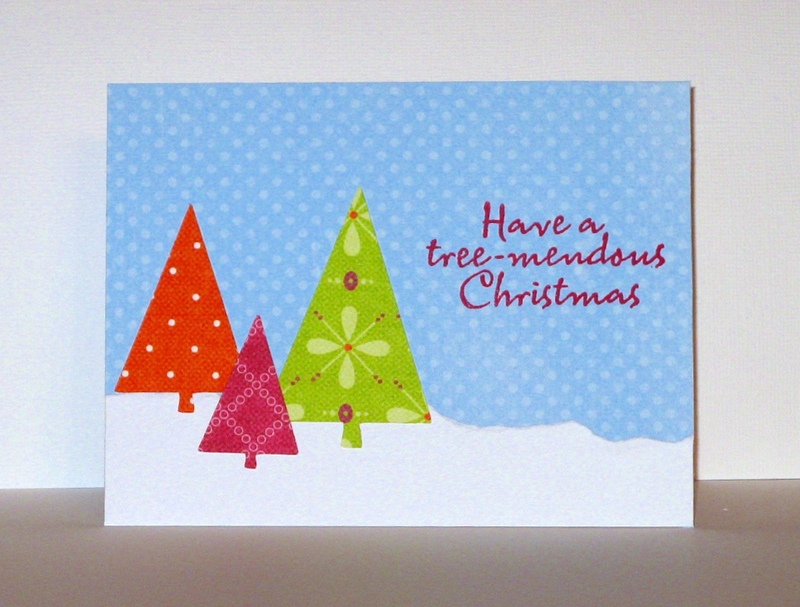 ...rocked the traditional red and green seriously well in this uber-cute card that's 100% festive fun! 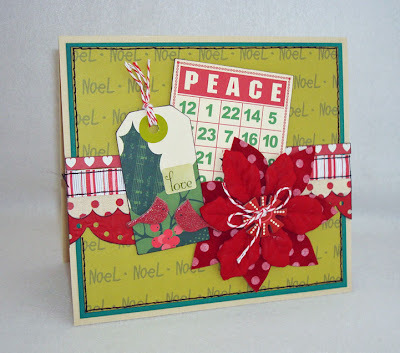 ...expresses not only "peace on earth" but also perfect papercrafting harmony with this utterly understated combination of lovely patterns and colors! ...elevates the clean & simple christmas card to bold new heights by paring down the sketch to its bare essentials, and then making every element COUNT! of Stamping, Crafting, Snow (& MOOSE!) Oh My! please contact kirsty via citycrafter @ gmail [dot] com to claim your prize! once again we renew our thanks to kirsty vittetoe for providing us with a lovely sketch, fabulous pixie dust paperie coupon codes, and an awesome prize! be sure to check out the weekly challenges at the city crafter challenge blog, where a new theme debuts every tuesday; and of course there's daily inspiration on the pixie blog as well! 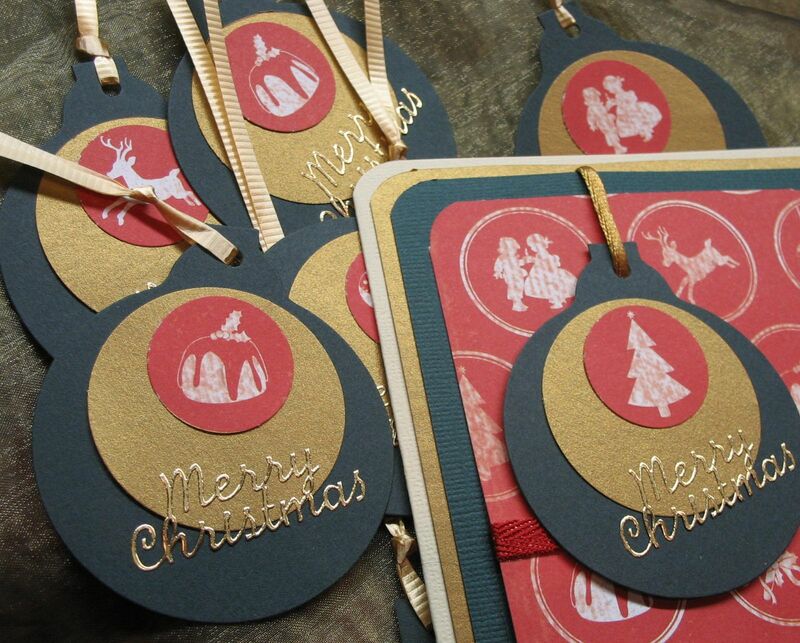 we ♥JINGLE BELLES♥ loooooooove card sketches, do we not? this week we're lucky to have an utterly fabulous one to work with, drawn by a very special belle indeed: ms. kirsty vittetoe!!! many of you know kirsty as the creator and lead DT of the awesome city crafter challenge blog; and i'm sure you've been wowed by the divine paper-based goodness at her own blog, handmade little things; but perhaps her favorite online role is as the owner and pixie-in-chief of pixie dust paperie, for which she puts together a wonderful collection of the latest and greatest papercrafting papers and embellishments each and every month! 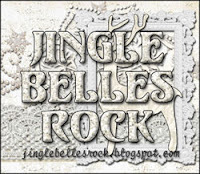 just use the code "jingle-belles" at check out! 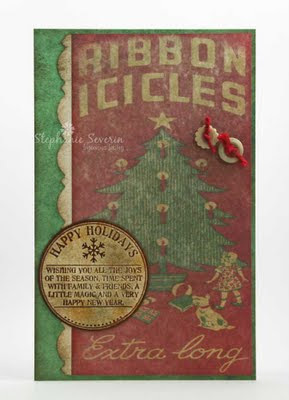 when you use the code "christmas-in-june"
supplies are limited... and AWESOME... so hurry to the PIXIE SHOPPE! 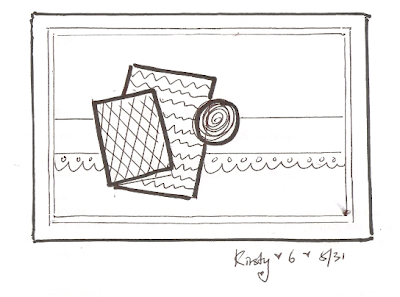 kirsty says, "I usually just scribble on my notepad whenever I have the inspiration, and when I need to make a sketch, I kind of look through my notepad at all the sketches, and mix and match them on a piece of scratch paper until I come up with a combination I really like. I have to say I love this sketch--lol! I see lots of possibility on the layering. To make my card, all I do is to pull out my Pixie Box (I have a box that keep all the past Pixie bits and pieces) and scraps mug (a mug that I keep other bits and pieces), and find things that go together, that's it!" 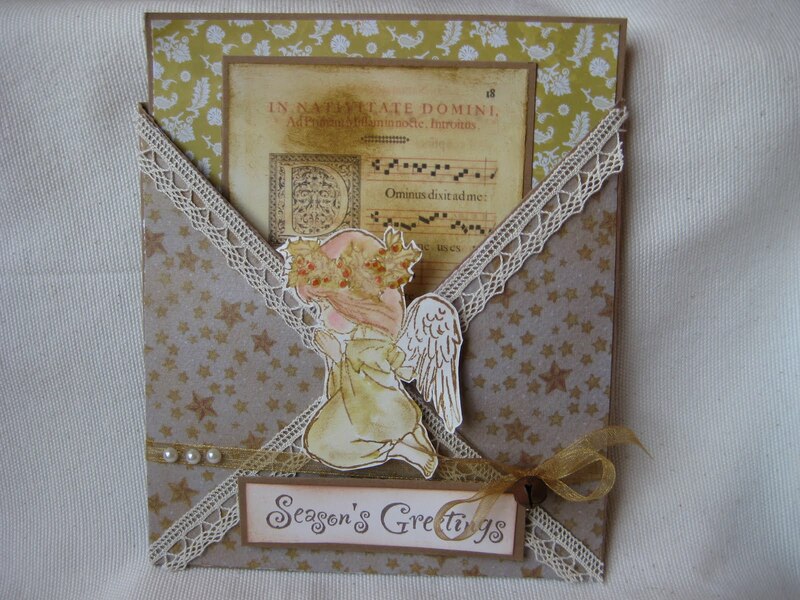 using October Afternoon Good Cheer papers. 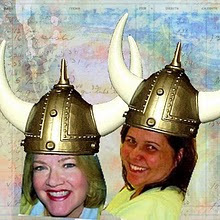 I added a little paper piecing and fun pom poms on the hats." lauren says, "one of the things i love most about sketches is that they're like jigsaw puzzles: all i need to do is look through my stash and find the appropriate-shaped pieces! 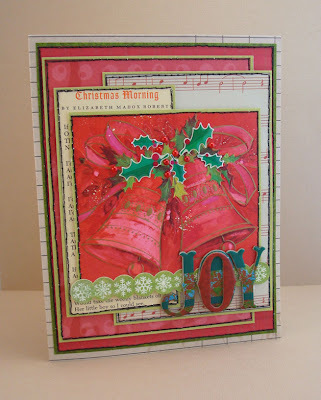 in this case i started with an (older) jenni bowlin mini bingo card and a (newer) dear lizzy xmas tag for the two main elements, and then filled in the rest with coordinating papers and embellies--mostly from the "scrap" file. 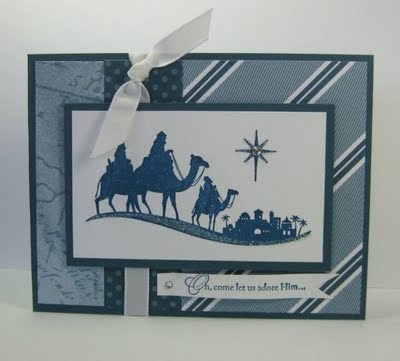 gotta love a card as easy as THAT, right?!" and now it's time to see what *YOU* will do with kirsty's lovely sketch: make it tall or short, make it traditional or funky, make it minimal or load on the layers?! just be sure to have PLENTY of fun, and link up here before 6pm (EST) next wednesday, june 15th, to be eligible for the random draw which awards the $15 pixie gift certificate!!! use the code JB24 if uploading to a gallery or to our flickr group. ...whipped up a glamorous and strikingly non-traditional (& unabashedly pink!) confection of fashion-inspired goodness that incorporates stitching, ribbon, seam binding, pearls, lace and more! ...made a simply and perfectly hand-embroidered trio of homespun christmas trees into the centerpiece of this lovely and charming C&S masterpiece! i bet you've guessed this week's theme already, just from the title, haven't you, JINGLE BELLES?! "let it sew, let it sew, let it sew"? uh huh, we pretty much HAVE to be painting, don't we? lol. 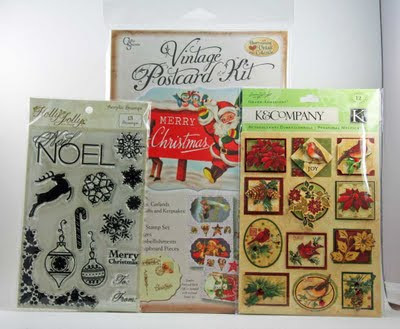 ok, nope, in fact we are, as the name suggests, incorporating sewing into our holiday cards; whether that be in the form of hand-stitching, via sewing machine, or even by using a pen, a stamp, or some rub-ons to add some faux stitching. anything goes! Stef says, "I used faux stitching down the sides of my main panel, which wascut from Webster's Pages paper. I used my new Sew Easy piercing tool to make the holes and a thin black marker to "stitch" down the sides ... it's somehow comforting to see that my faux stitching is just as wonky as my real sewing would be. I finished with some rub-ons and a wrap of some Mission Falls Ivory Cotton yarn." Lauren says, "i played around with a few different techniques this time: i hand-cranked my sewing machine around diecut letters in heavy-weight black upholstery thread to outline them; i used ordinary red thread to attach ruffled ribbon to the main panel, and the main panel to my card; and finally i used three strands of black embroidery floss to hand-stitch the word "christmas" using this method. it's probably a bit of overkill but i had a blast making this!" and now it's time to see what ♥YOU♥ will do: bust out the sewing machine and maybe even some fabric? do a little bit of hand embroidering? get the look without the work and "go faux"? or maybe you'll try a little bit of everything??! it's up to you, but the main goal is to have plenty of fun and MAKE IT SEW!!! the inlinkz will be open until 6pm (EST) next wednesday night, june 8th; keyword for galleries or flickr is JB23! 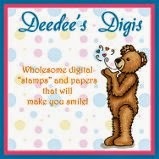 Thanks to all of you for making it another inspiring week here at the ♥JINGLE BELLES♥ blog! 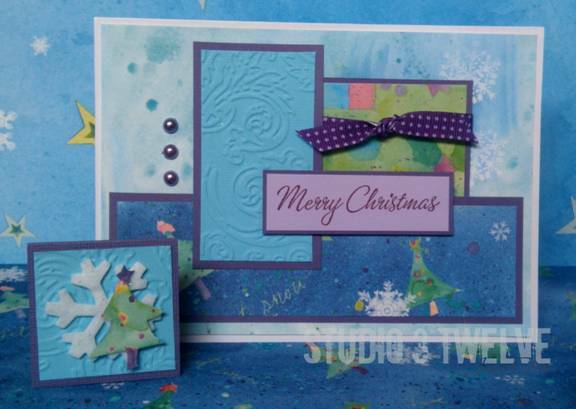 We love seeing how your holiday card stashes are growing with fantastic designs. thank you very much to *EVERYONE* who played along; and extra special thanks to Julie Tucker-Wolek of Life with Tucker and Wolek for being our lovely guest star this week! 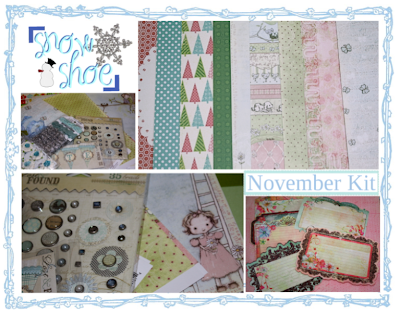 And a HUGE Jingle Belles thank you to Nikki Sivils Scrapbooker for sponsoring this week's holiday card prompt.